The original cottage at 2748 Michigan Avenue was a modest one-bedroom structure. Over the years, the garage and front porch were enclosed and another addition was constructed. Like all parcels in Dean Park on the southerly side of Michigan Avenue, this parcel was purchased by The Carl F. Roberts Company in 1913, who purchased 46 lots in Evans Addition for a total price of $6,000. The 1922 Sanborn Insurance Company map shows this as a vacant parcel. In 1924, nine of these lots, including this property, was purchased by John M. Dean, the developer of Dean Park, with a $9,000 purchase money mortgage from The Carl F. Roberts Company. Mr. Dean re-sold these parcels in 1924 to The Fort Myers Realty Company, subject to the Roberts mortgage. On July 17, 1944, this parcel was purchased by Louis H. Furen, Jr., who already owned and occupied the home across the street at 36 Michigan Avenue. Mr. Furen owned this cottage and rented it out to various tenants until 1974, when he sold it to James and Gail Cash. The first occupants of the cottage appear to be Solon S. Duncan, a detective with the Atlantic Coastline Railroad, and his wife Charlotte and two sons. The Duncan family was living in the cottage in 1946, but soon moved to nearby Evans Avenue. The 1947 Fort Myers city directory shows Willard E. Johnson as the occupant. Mr. Johnson was the parts manager of Dixie Motors and was a newly-wed, having married Mamie Frances Kelley of Atlanta on June 2, 1946. The Johnsons did not remain tenants here for long and purchased a home at 42 Second Street where they lived for many years. 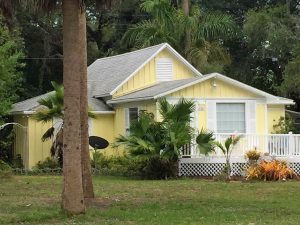 In 1949, New Yorker Edward A. Illsche and his wife Margaret arrived in Fort Myers and would be tenants in this home for almost ten years. Mr. Illsche founded a variety of businesses in Fort Myers, including Sewing Machines O’Florida and several publications, the Real Estate Review, the Real Estate Guide and the Lee County News and Shopper. He also was an unsuccessful candidate for City Council in 1960, campaigning in favor of improved paving and drainage in Fort Myers. Other address: 21 West Michigan Avenue; Evans Addition, Block 1, Lots 37 & 39.